The GDPR (General Data Protection Regulation) is a new EU regulation that is replacing the 1995 EU Data Protection Directive (DPD) with an aim to enhance the protection of personal data for EU citizens and increase the obligations on organizations who collect or process personal data. It’s actually a great move for companies to step up their systems and protect your data! With this new update, regulations will also apply to non-EU businesses who are marketing products to people in the EU as well as companies monitoring the behavior of people in the EU. Basically, even if you’re based outside of the EU, as long as you control or process the data of EU citizens, the GDPR will apply to you (aka parts of Demio). Starting on May 25th, 2018, this regulation went into effect, and if you want to read more, you can view the full text of the GDPR here. We know as a user, there’s a lot to worry about, so we wanted to offer a comprehensive outline of what Demio is doing to help you 👏! Demio is 100% GDPR compliant for your business 🙌. Demio is also Privacy Shield compliant and approved (find our listing here). Privacy Shield was created specifically for US companies and has a different set of regulations or requirements than a company operating in the EU. For complete compliance, Demio has released an account-wide GDPR setting that you can enable for your account. You'll find this in the General tab in your account settings. When you enable the GDPR setting and add your company name, we'll automatically add extra GDPR checkboxes on your registration page and embed forms. The first checkbox is required for a user to register for the event and will allow the contact to receive the reminder/replay emails for their registered event. 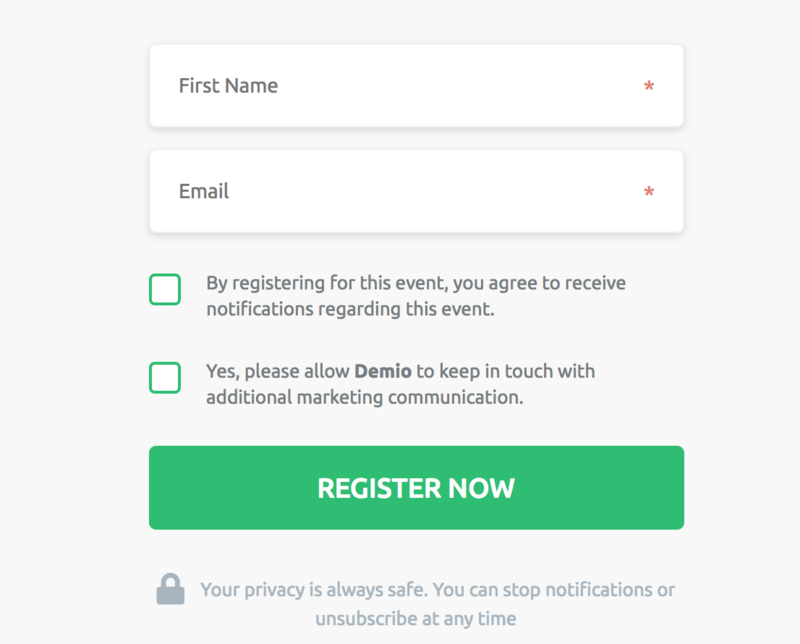 All Demio emails contain the ability to delete their registration (which deletes them completely from Demio) or cancel their registration (removing them from that webinar’s reminders). The second checkbox will only appear if you have an integration attached. This is an optional field they can choose to confirm, if they want to be added to your CRM or autoresponder. Once that GDPR setting is turned on, we also remove access to the 1-click email and add more compliance information around our API, so you can be compliant in its usage. As far as your personal data, Demio takes this extremely seriously. If you cancel or delete your account at any time, you can request a removal from Demio and we will delete and remove all your account info, including all your Demio registrants, event info, and customer data. If you have any further questions, just reach out to our support team for access to our Data Processing Agreement or further GDPR details.